KPI have been around for quite a while, and their utilisation have grown exponentially in the last few years. With the arrival of various analytic solutions that now provides a tremendous amount of raw data, marketers are now more than ever challenged to produce insightful aggregated data for their executives. This article will be the first of a series that will seek to explain what are KPI’s, the different context that web site segment themselves into and finally, a review of various KPI exposed and explained. The best way to approach this question would be to start by a quick definition. Let’s start with the official definition from Investopedia: A set of quantifiable measures that a company or industry uses to gauge or compare performance in terms of meeting their strategic and operational goals. The only thing I would have to add is that they are not only required but also fundamental to complement any business strategy activities. KPI also allows the team to develop a feeling of responsibility and belonging toward the results obtained. By having a dashboard (a collection of preselected and relevant KPI) that is shared to a specific team, it will act has a motivational tool by providing concrete insight in the team performance thus enhancing peer efforts. But for who are those KPI principally made for? Because of their strategic nature, dashboard and KPI aim at any executive or person in a position of authority that has to track the company performance. So if you are reading this, are a marketing executive and are managing a team of web marketers or a web marketer having to come up with the right KPI, well you re at the good place! Now, how to choose them? They’re so many of them, which one applies to your company? The best indicator of which KPI to select will be your business strategy. It highlights your long-term business objective using your organization’s mission and vision. Another reason why your business strategy is a good indicator is that you invested so many efforts building it, but more important, you fully understand it. By using your business strategy, you will be able to select KPI that you will also fully understand. A major source of failure among businesses that are implementing dashboard is that they don’t fully understand the selected KPI… What actually happens when you don’t understand your KPI is that you will also not see the importance of tracking them… And that will eventually lead to the abandonment of your tracking activities. -The M stands for measurable. In the case of KPI, ratio and percentages will be preferred to raw numbers. Ratio allows the interaction of different variable and are, therefore, much more valuable than raw, un-aggregated data. -The A stands for actionable. This is a core value of a KPI. There is no point on selecting a KPI on which you cannot work. If it is impossible for you to have an impact on this metric, don’t track it. Focus only on what you will be able to interact with. -The R stands for relevant. Does the selected KPI goes along the same direction as your business strategy? If it does not, then it is not relevant, and you should not compromise resources on it. -The T stands for time bound. It is crucial for KPI to have a starting point or that they can be compared over time. This is particularly important to identify trends of other behaviour that could go unnoticed without a proper time comparison. Now that you know how to select your KPI, how many of them should you select? That is a tricky question that only depends on you. You have to keep in mind that a dashboard using KPI is meant to be a tool that saves you time. The literature varies greatly on the quantity of KPI to have on your dashboard but generally it revolves around 10-20. Based on personal experience, I find it more convenient to work with 10-15 KPI. More than that, it becomes very time consuming. 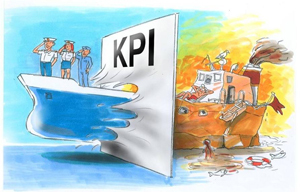 In conclusion, now that you know what KPI are, what it does and how to choose them, you are fully equipped for the part two of this series of article that will be posted shortly. In this second article, we will explain the various type of websites, their core objectives and the KPI that are best suited for each type of website. Stay tuned!